Welcome, Christmas, bring your cheer. We need it. It has been quite the roller coaster of a year and right now, what we need most, is to cram into Nonna’s tiny kitchen, listen to tacky Italian Christmas music and pound out some spiedini and veal. My family has so much to be thankful for. We have truly beautiful friends, we have our health and most importantly, we have each other. Faced with loss and disappointment our foundation might shake a bit, but at the end of the day we are solid. It’s sad to think that some people don’t have this support. Perhaps sadder to realize that sometimes the reason they don’t is of their own doing. So I am reminded to be thankful, very thankful for all of the wonderful people that surround my family and me. The recipe I want to share with you is very special to me. In Italian these cookies are called “Sfingel”, but to me they are simply Uncle Danny’s Honey Cookies. Delightfully intricate, they look almost like snowflakes, snowflakes that have been doused in warm, golden honey. They were my Uncle Danny’s favorite Christmas dessert. Every year growing up I would watch Nonna putter around the kitchen a few days before Christmas mumbling, “I still have to make Uncle Danny’s Cookies”. I would ask, “why are these Uncle Danny’s cookies?” and Nonna would say, “Because he’s the only one who eats them!” Now, I didn’t think it was quite fair that Uncle Danny got a whole plate of cookies all to himself, especially cookies covered in honey. So being all of eight years old, I remember making sure that he knew they were now my favorite cookie too. He was more than happy to share. That was his nature- to share and to take care of those around him. And to school you on the finer points of republican politics. Now, we’ve already established that I am very much a liberal so you might assume that Uncle Danny and I didn’t get along. And you would be so wrong. On Christmas afternoon, Uncle Danny would step into the room with a glass of wine, sit down next to me and ask, “So how’s your girl Hillary?” And we’d be off. Our conversations were one of my favorite parts of Christmas. He loved people who had different opinions (er, I’m still working on that) and my memories of the verbal sparring between he and his brother, my Uncle Angelo, were conversations screenplays are born from. They talked politics all the way through antipasto, took a break for dinner, and then would pick it up again for dessert. They were wise enough to realize that politics and pasta are never a good mix. This will be our first Christmas without my Uncle Danny. The table will surely feel a little bigger, and the room a little quieter but there will be two things of which I am certain. There will be no politics during pasta, and a big plate of Uncle Danny’s Honey Cookies will be prominently placed in the middle our table. Now, I am not a religious person but I’m sure that Uncle Danny would have closed this with a prayer. I instead, will rely on Dr. Suess. “Welcome, Christmas, bring your cheer. Cheer to all Whos far and near. Christmas Day is in our grasp so long as we have hands to clasp. Christmas Day will always be just as long as we have we. Welcome Christmas while we stand, heart to heart and hand in hand." As delicious as these cookies are alongside a cannoli or two, they are even better for breakfast. Trust me on this. One more thing, these cookies are somewhat labor intensive. Especially when trying these for the first time, but don't get discouraged. Remember, it's the journey. 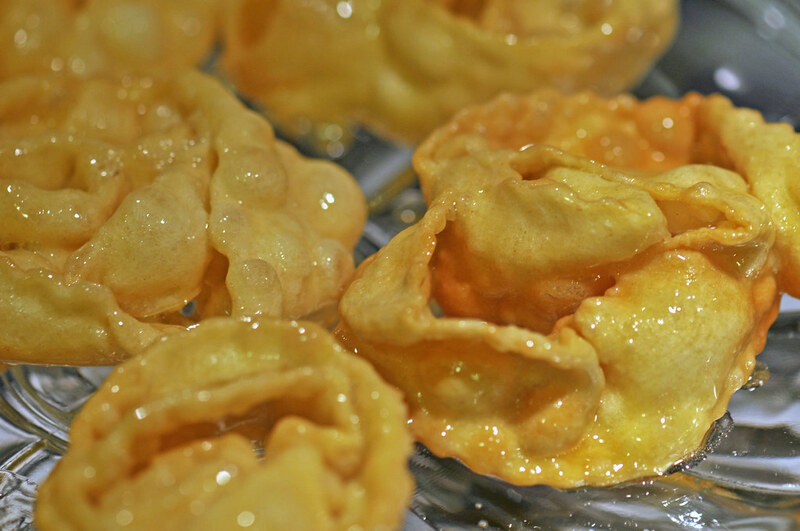 The first step of the honey cookie making process is much like making pasta dough. Using the paddle on your KitchenAid, combine ingredients one through six and create dough. Gather the dough with your hands and form a ball. Divide the dough into rectangular blocks, a little smaller than the palm of your hand. Turn on your pasta maker and put it on the widest setting. I use the KitchenAid pasta maker attachment, and the widest setting on that is 1, but yours may be numbered differently. Run a piece of the dough through, and then gently refold it back to the rectangular block shape. Repeat this process four times. Then adjust the setting to level 2 and run the dough through. DO NOT fold the dough this time. Adjust to level three and repeat. Rest the finished dough on the table. Repeat the process the remaining dough. Once all of the dough has been rolled out let it rest about 20 minutes. Then, using your dough-crimping wheel, cut strips about 8 inches long, and ½ inch wide. Now for the fun part! Taking one strip, begin to roll it. The end result will look much like a fully bloomed rose, or for those of you who grew up in the 80’s, like the “Six Feet of Bubble Gum” that was rolled up to look almost like a snail. Using one finger as your “egg white finger” carefully dab the dough every ½ an inch or and press it together with the next layer of dough. Continue dabbing with egg whites as you finish rolling the strip. 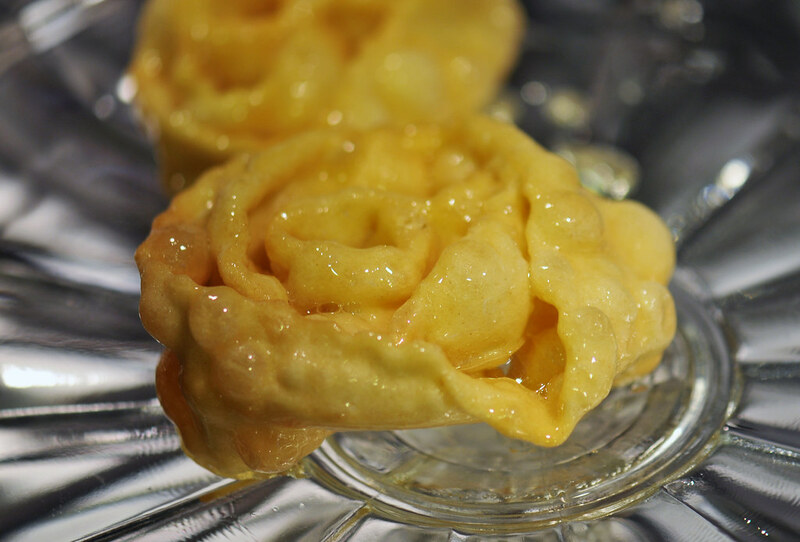 What your doing with the egg white is ensuring that the “rose” holds its shape during the frying process. Let the rolled cookies sit out for about an hour. Fill either a deep fryer or a pot about ¾ of the way up with corn oil. Once the oil is rippling, you’re ready to fry. Carefully, using a fork drop two or three cookies at a time into the oil. They will immediately puff up. They only take a minute or two to cook, so as soon as you see the color turn light gold, get them out of the oil and onto a paper towel. At this point, the cookies can be stored or frozen until you are ready to serve. You should dip them in honey the day you serve them. To do this, combine the honey and sugar in a small pot and heat until it begins to boil. Carefully dip each cookie in the sticky mixture, covering the cookie completely. When you finally take your first bite do me a favor, think of my Uncle Danny. My parents always made these cookies but we would add a little water to the honey when we warmed it to thin it a little & never added sugar. Do you remember what they were called? We seem to have some confusion on the spelling of these cookies. Merry Christmas!